Gorgeous 4 bedroom 1,425 square foot bungalow with Lake views, located in the gated community of Estates at Waters Edge has fully finished basement and oversized double garage with storage nook. 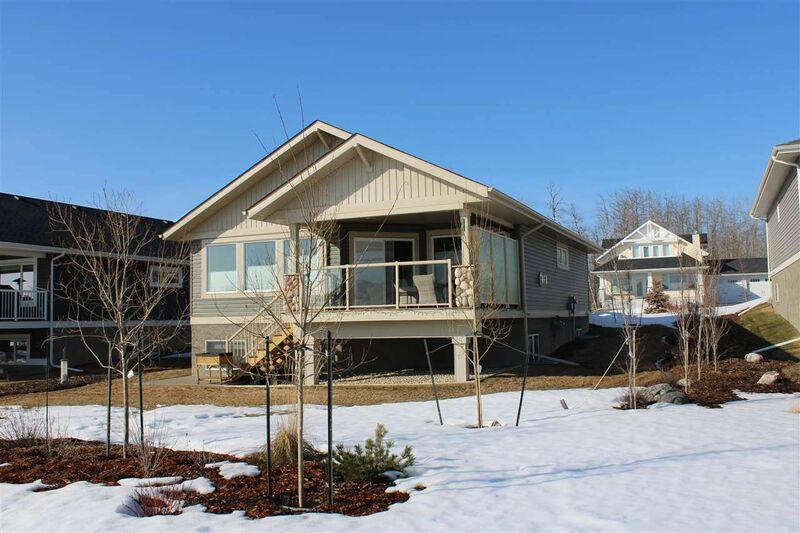 Enjoy the fully landscaped yard, private rear patio & deck with views to Lac Ste. Anne. This fully air conditioned home features an open concept living area with stone facing on the gas fireplace, large dining area, Chef's kitchen with working island, granite counter tops & back splash, high end appliances & fixtures, corner pantry and lots of cupboards. Step thru the upgraded patio door to your spacious raised deck featuring privacy glass, and access to the landscaped lawn area. Master suite has its own 4 piece ensuite with granite vanity. One more bedroom and a 4 piece bath complete the main level. Fully finished basement has huge windows in the rec. room to let in lots of natural light, a corner gas fireplace with remote, 2 bedrooms, laundry room and a 3 piece bath. Community pool, fitness centre & clubhouse. Drive West on Yellowhead to Hwy 43. Go North on 43 to Gunn. Left at the Esso station and drive South just past the tracks.